Star Camp is for the child in all of us. If Harry Potter were a muggle, he would spend his summers at Star Camp. Like Hogwarts School of Witchcraft and Wizardry, Star Camp does not appear on any map. Call it Area 52 if you like, but it isn’t identified by name or number. The campers are told it’s Star Camp. They are not told that it’s the setting for the ultimate top-secret program, a training ground for the next generation of space explorers. Imagine summer camp on steroids, where everything is bigger and more dangerous. Tucked away in a luscious green landscape, this former Cold War military base contains everything from a vast mountain complex of tunnels and waterfalls to the world’s largest treehouse, complete with chutes and ladders. It’s where ordinary kids are tested in extraordinary ways during six weeks of intense combination and insane fun. 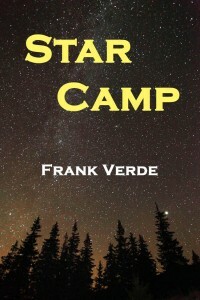 Part science fiction, part mystery, Star Camp is a nonstop adventure romp that is meant for the entire family. I have been a professional writer/editor for more than 30 years. And in all that time, I have never had a more enjoyable experience working on a story than I did with Star Camp. That’s not hyperbole, nor is it marketing mumbo jumbo. It’s the God’s honest truth. Now it was Gage who squirmed in his seat with excitement. George “Bulldog” Broward folded his arms across his chest, a self-satisfied grin forming above his rock-like jaw. “Of course,” Mugabi added, seeking to assure the youngsters, “you will be ready for anything once it is time for the survival test. I am sure everyone will come through the test with flying colors.” She glanced back at Bryant when she said this, seeking reassurance herself, but it didn’t come. The colonel just continued to stare straight ahead. The colonel stood and came around the table to Doctor Mugabi. “Thank you, doctor.” She passed him the microphone and joined the counselors on stage. At that moment, floor boards in the middle aisle parted and a glass compartment carrying a man in a white lab coat appeared from below. He was writing on a clipboard. Campers were impressed, to say the least. Martin and Gage exchanged glances. They didn’t speak, but they didn’t have to. Both boys weren’t crazy about being watched at all times, and it showed on their faces. Part of the fun behind Star Camp is the story, but much of my enjoyment evolved from the main characters. They are kids who we grew up with or wished that we grew up with. For those who are turned off by “kid’s stories,” I say it’s as much a kid story as the Harry Potter books are. All are fun reads that transport the reader to magical worlds, whether driven by sorcery or alien technology. Nice work Frank! There was a novel written a number of years ago (circa 1999-2000) by Camille Cusumano called “The Last Cannoli”, a fictional tale about a Sicilian-American family’s experiences growing up in a neighborhood much like ours…not sure if it’s still available but it was only on amazon.com. I can only imagine what you could do with such a topic and the characters we knew as kids! Continued good luck with your books and all your future endeavors my friend! Thanks. You should give One Christmas Knight a try. You’re going to recognize a lot of the characters and places in the neighborhood. Plenty of laughs, too. You don’t need a kindle, but it helps. You can download it right to your computer. All you have to do is fill out an amazon account.